Imagine the smell of an orange. Have you got it? Are you also picturing the orange, even though I didn't ask you to? Try fish. Or mown grass. You'll find it's difficult to bring a scent to mind without also calling up an image. It's no coincidence, scientists say: Your brain's visual processing center is doing double duty in the smell department. Since previous studies had shown that the brain's visual center lights up with activity when someone does a purely smell-related task, a group of researchers set out to test what these two senses have to do with each other. Does the smell merely remind us of the visual? Or do our brains actively route scent input through the visual cortex, because it's a crucial step in our processing? Led by Jahan B. Jadauji at McGill University, the researchers tested this using a potentially alarming tool called repetitive transcranial magnetic stimulation (rTMS). The technique involves a large coil, placed against a person's head, that sends magnetic pulses into a chosen region of the brain. The electric current startles that area of the brain into extra activity. TMS coils are sometimes aimed at the front left of patients' brains to treat major depression. Here, researchers placed the TMS coil at the back and base of the skull, where the brain's visual processing center (counterintuitively enough) sits. Magnetic pulses stimulated the visual cortex, an effect that would linger throughout the testing session. Researchers first made sure of this by testing their subjects' visual perception and observing that it improved after TMS. Both before and after their visual centers had been excited by magnetic stimulation, subjects sat for a smelling exam. They first sniffed scent-holding pens of different strengths to measure their noses' sensitivity. 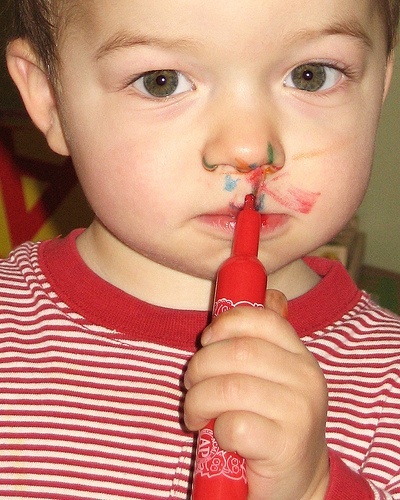 After TMS, subjects sniffed sets of three identical-smelling pens and told researchers which was the strongest. Then they sniffed sets of three equally intense pens and decided which of the three had a different smell (cloves? lemon? turpentine?) than the other two. Finding the strongest smell didn't require subjects to identify what the smell actually was--and they didn't do any better on this task after their visual cortices were amped up with TMS. But finding the mismatched smell out of a group made subjects think a little harder about what they were smelling. And on this task, subjects performed better after TMS. The researchers also tried a sham TMS procedure, in which coils were held to subjects' heads but didn't actually fiddle with their brains. And they tried aiming the magnetic stimulation at subject's hearing centers, rather than visual. Neither of these steps improved subjects' performance at picking out mismatched scents. Only stimulating the visual cortex did the trick. This means, according to Jadauji, that the brain's visual processing center is specifically involved in how we process smells. Marring the curriculum plans of kindergarten teachers everywhere, our sense of smell--or at least our skill at identifying different smells--may rely on our sense of vision. It's intriguing to wonder what other parts of our brains might be secretly conspiring in this way. Do we also use our visual centers when we identify sounds? Or touches? If identifying a smell requires that we call up a mental image, do we also carry that processing a step further into our language centers, naming the thing we've identified? A previous study found a connection between mental illness and the ability to identify smells. Tracing the connections between our senses might lead to a better understanding of functional and dysfunctional brains. Of course, it's hardly news that people's senses can play together in unexpected ways. Earlier, I was tempted to write that it's "impossible" to imagine a scent without an image, but I remembered that I kind of have a problem keeping my senses separated. Don't feel too superior. It may turn out that everyone is a little bit synesthetic after all. It's amazing how a scent can bring back a memory from many years ago. A friend was wearing a cologne that I wore in high school, some fifty years ago. I haven't worn it since then but I immediately recalled the name and remembered times when I had worn it. The very first question came to my mind was what about the blind people? They also have some sense of smell but they don't have any image of that particular object as they haven't seen them before. How do they define it then? Also, the next point is, if a child is learning to tag a particular smell to a particular object, what would be the first perception he/she has? Olfactory or visual? My grandparent's old home came up for sale and since I had my very best childhood memories there, during summers as a kid, I decided to check it out. It looked a little rundown, garden-wise, since my grandpa was an avid gardner and so I was somewhat disappointed with the outside of the property, plus I didn't like the closed-in sun deck, where I used to sleep, looking up at the stars, on warm summer nights, hearing the traffic sounds of the city several miles away. However when I went through the front door and stepped into the front hall, I exclaimed, after 51 years, "Oh, it smells exactly the same!" I recognized the scent of the inside of the home and could hardly believe it, after 51 years! Scent & memory are definitely connected.